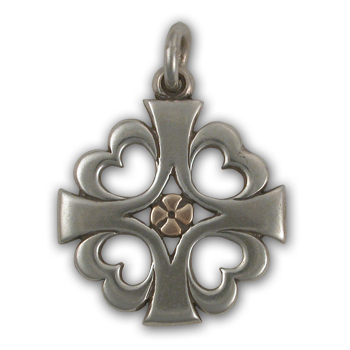 Stylishly share your belief in the Wiccan tradition by donning our exclusive Pentagram Moon Pendant in Sterling Silver. 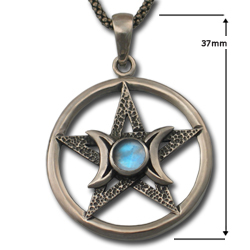 This artisan hand-tooled pendant consists of a textured, antiqued, and stylized pentagram and double crescent moons design with a lustrous round cut bezel set rainbow moonstone centerpiece contained within a circle, and it’s compatible with any chain style necklace. Chain sold separately. Nice design and good detail with a lovely gemstone.Easy to buy and arrived on time. I collect ocean-themed jewelry and I really like this pendant. Price was okay too!